Blue mussel. 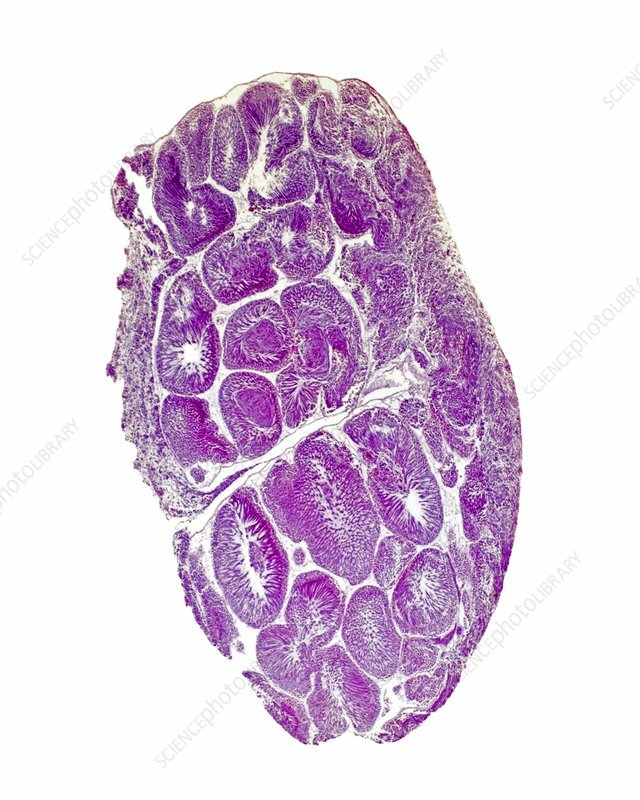 Light micrograph of a transverse section through the gonads and mantle of a male blue mussel (Mytilus edulis). The oval structures are seminiferous tubules, the site of spermatogenesis (sperm production). Mature sperm cells can be seen closest to each tubule's lumen (white), with their tails protruding into the lumen. Moving away from the lumen are increasingly immature precursor cells; first spermatids, then spermatocytes and finally spermatogonia. The outermost cells are sertoli cells, which nourish the maturing sperm. The mantle (left nad right) covers the soft parts of the mussel and lines the interior of the shell. It secretes calcium carbonate, which forms the shell. Magnification: x7 when printed at 10 centimetres tall.